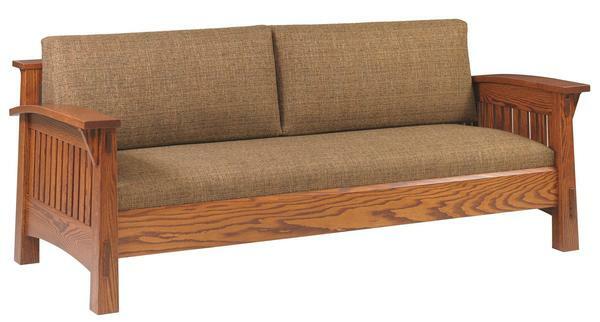 This Amish Country Mission Sofa combines fine upholstery with high quality solid wood to provide the best comfort and longest lasting furniture for your home. A sofa is something that is supposed to last for years. It's a place that the family gathers for comfort, for a friend-in-need to sleep on, a place to watch a movie with that special someone. Our goal is to provide that piece of your home for you. Our furniture is hand-crafted by the finest Amish wood workers in the USA, to best fit your needs. Look into a chair or table to compliment this beautiful mission-style sofa. We take pride in the quality of our furniture and the variety of choices provided to you in the wood, finish, and fabric, so that no customer has to walk away due to a lack of versatility in customizing one of our products. Ask one of our furniture specialists about the finishes and fabrics available for this sofa.